Everyone knows Billy Graham . . . but who knows what propelled him to world prominence as the greatest evangelist of his time? Readers will find out in Igniting the Fire. This brand-new biography focuses on Graham’s formative years, from his boyhood through college, to his bursting onto the national scene in 1949. Author Jake Hanson, like Graham a graduate of Wheaton College, has drawn upon scores of original documents and new interviews to detail the environment, the movements, and the mentors that created Billy Graham’s passion to spread the gospel. Readers will see how God, in His sovereign wisdom, brings unique influences to bear to accomplish His will. Order Igniting the Fire today! 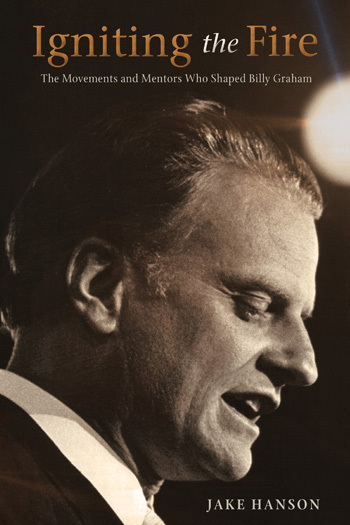 There are dozens of biographies written on evangelist Billy Graham, including his impressive 800 page autobiography, and hundreds more written on different aspects of his life and ministry. Why would another biography on this important figure be necessary? Igniting the Fire offers an in-depth look at an important time period previously glossed over using fresh insight, new and detailed research, and a compelling writing style which will delight the casual as well as the serious reader and student of history. Have you read Igniting the Fire and you want to see the places and mentors described, and wouldn’t mind seeing a few pieces of memorabilia and background into the book—interesting information that didn't fit? You have come to the right place! Click below to access hundreds of articles, pictures, and other artifacts from the 1930s and 40s used to craft Igniting the Fire! Click here to enter the Bonus Materials! “Reading biographies of persons who have maximized their lives for Christ always inspire me. Given that reality, Jake Hanson has done us all a favor by giving us glimpses not only into Dr. Graham’s college years but into the early influences that empowered Dr. Graham's future ministry. This unique perspective on Billy's ministry should make us all aware of the potential of our impact on others and the debt we owe to those who have formatively empowered our journey. Igniting the Fire is particularly motivational to me as a college president. This book will stand tall among the many others that have sought to find the key as to why the Graham story is so amazing. I give it five stars!" "Billy Graham rose from the humblest of beginnings to become during the second half of the twentieth century one of the world’s most recognized and respected figures. His evangelistic messages reached a larger audience than any in history. How could it happen? Jake Hanson’s Igniting the Fire offers an intimate look at the unlikely origins of this extraordinary man, and the still more extraordinary ministry God granted him." “[In Igniting the Fire readers will see how God built] His man through the landscape of details, interweaving circumstances, heart wrenching decisions, and human drama. The extra bonus for all who will travel with author Jake Hanson is recognizing the principles of God’s care and guidance for Billy. They soon discover that these principles are available to them! This is a must read for all who are walking the Christian life." “Is another book about Billy Graham really needed? Yes, because the author, Jake Hanson, has unearthed valuable yet largely unknown facts about the early life of this man, who was indisputably the most influential evangelist of the twentieth century. He was given access to much information which does not appear in many of the writings about Graham. The author emphasizes three great facts about Graham’s early years: First, the small inner core of men who deeply influenced him by their life and personal friendship, Second, the work of God through the Holy Spirit in Billy’s life during the formative years, Third, his development as a great evangelist.